How Social Media is Changing Affiliate Marketing panel from Affiliate Summit East 2008, which took place August 10-12, 2008 in Boston, MA. The 2nd GrowSmartBiz Conference is taking place in Washington D.C. on Friday, November 5, and I wish I could go. But I’m moving to Austin TX the following week, and things are too crazy with all of that. The GrowSmartBiz Conference is being organized this year by the Washington Business Journal and co-sponsored by Network Solutions LLC and Capital One Financial Corp.
Read more about the event from Shashi Bellamkonda, Network Solutions “Social Media Swami” in the Washington Business Journal. I met Shashi when he spoke at the Affiliate Summit Social Media event back in 2008, and he knows he stuff when it comes to small business. Last year, there were over 400 small business owners at this event. Looks like a great opportunity to network and learn. RingRevenue has announced record mobile campaign growth with third quarter call volume up more than 500 percent compared with the first quarter of this year. The company states that conversion rates are as high as 47 percent and top mobile affiliates are earning more than $75,000 per month in pay-per-call revenues. U.S. mobile ad spending will grow nearly 50 percent to more than $1 billion next year, according to eMarketer. Also, Morgan Stanley reported in the last year that the mobile internet is catching on faster than its desktop predecessor, predicting that half of the web browsing in this country will be done on mobile devices by 2014. Lots of opportunities for affiliates in mobile – get off the sidelines already! It’s OK to Monetize! That was the message we were sharing from the Affiliate Summit booth at BlogWorld Expo 2010 about the upcoming Monetize Summit. Monetize Summit is sort of a conference within a conference, as it is taking place Sunday, January 9, 2011 at Wynn Las Vegas during Affiliate Summit West 2011. This series of beginner educational sessions on the Sunday of the conference are focused on monetizing content. Monetize Summit is open for anybody to register at a rate of $1,000 to attend. This pass does not include access to the rest of Affiliate Summit West 2011. Folks who register for Affiliate Summit West 2011 with a Platinum or Diamond pass can attend Monetize Summit for free (just select it when registering). There will be five hours of sessions focused on turning your blog into a profit center, making money using pop culture content, tips and tricks to increase conversions, and using a datafeed to monetize your site. SearchForecast recently published insights from their Premium AdSense Publishers Survey. The data was collected via online surveys with 40 premium AdSense publishers in October 2010. Respondents were selected by SearchForecast for having a Google PageRank of 4/10 and higher, and an Alexa rank of less than 100,000. Additionally, 60% of the AdSense publishers had run AdSense ads on their site for 3+ years, while 30% had been running AdSense for 1-3 years. Findings in the report include how 20% of AdSense publishers have never heard from an alternative ad network, and 70% of AdSense publishers are willing to switch to another network for better payouts. Read the Insights from Premium AdSense Publishers Survey. There is a new service called Atma Links, similar to SkimLinks and VigLink, that automatically convert existing links into affiliate links. 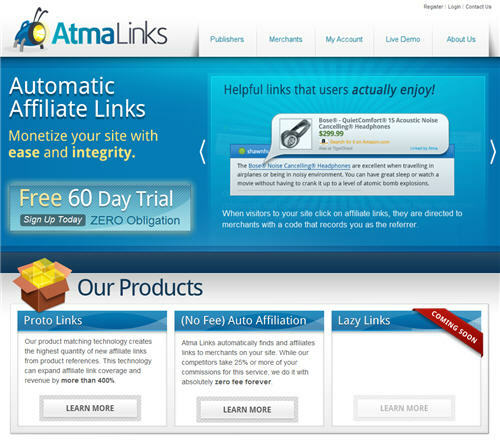 Similar to their competitors, the Atma Links technology automatically converts regular product hyperlinks into paid affiliate links, and this service is free to affiliates. The company also has a paid service called Proto Links that automatically generates new affiliate links from unambiguous references in text. The Atma Links Proto Links technology (see a live demo) accomplishes this by analyzing webpages in real time for text that matches their database of millions of products. Landing Page Testing to Attract Super Affiliates presentation from Affiliate Summit East 2008, which took place August 10-12, 2008 in Boston, MA. Landing Page Testing can lead to double digit conversion rate gains. Learn how to test your pages to improve conversion, and attract super affiliates without changing your payout structure. The twelfth issue of FeedFront Magazine is out, so we’re on to issue 13. The next issue of FeedFront will be coming out in January 2011. This issue will double as the conference program at Affiliate Summit West 2011. If you are interested in writing an article, go to the FeedFront proposal form to submit a one sentence summary on what you’d like to cover. Articles are a maximum of 500 words – no exceptions. Anything longer will not be considered. You will be contacted whether or not your proposal is accepted for the next issue. The speakers for Affiliate Summit West 2011 are posted, so you can see who will be speaking, which company they represent, and their Twitter name (if they provided it). Following speakers on Twitter is a good opportunity to start networking with them in advance of the conference. Check out the Affiliate Summit West 2011 agenda to see when and on what topic they are speaking on. If you’d like to follow all of the speakers in one shot, you can follow the Affiliate Summit West 2011 speaker list on Twitter at http://twitter.com/#!/list/affiliatetip/affiliate-summit-west-2011-speakers. Posts from the Affiliate Summit West 2011 speakers are also organized in an online newspaper format at http://paper.li/affiliatetip/affiliate-summit-west-2011-speakers. If you don’t want to have to remember to visit daily, you can opt-in to receive a reminder by email each day. I just read UnMarketing by Scott Stratten, and it’s really an entertaining book. You may know Scott as @unmarketing on Twitter, and if so, you know he’s a funny guy. If you don’t know him, you’re in for a treat with this book. There are 56 chapters of bite-size, fun to read advice on having a conversation with your audience and engaging them. UnMarketing is one of those books where you can jump around without getting confused – the chapters don’t really rely on a chronological read. Lots of examples and case studies, and Scott brings the funny, which is a nice departure from the typical business book. I’d recommend UnMarketing for any business looking for ideas and inspiration to connect more and better with their customers.